I’ve had conversations with several BPD “experts” about borderline behavior. 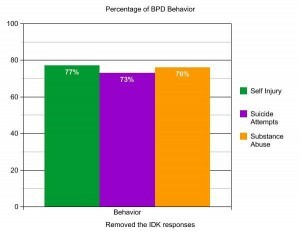 There seems to be an assumption that many people with BPD are “silent” or “high-functioning” and do not engage in dangerous and/or ineffective behavior often attributed to the “typical” borderline. If you’re not throwing full-blown temper tantrums, freaking out because EVERYONE is out to get you, threatening to hurt or kill yourself, running away from those who love you because you’re afraid they’re going to leave you first, complaining that NOBODY loves or respects you AND popping pills and guzzling alcohol all at the same time… then, I think, you can go ahead and disqualify yourself. As you can see by these polls results, more than 73% responded that their borderlines (or themselves if they have the disorder) indicated that they have engaged in self-injury, suicide attempts and/or substance abuse. While these polls are certainly not scientific and it’s pretty much impossible for me to understand the profile of a person that responded, they results are, for me, striking. If 7 out of 10 (or more) individuals engage in these “low functioning” or ineffective borderline behaviors at some point in their lives, what should that tell us? I believe that it tells us that the “typical” profile of someone with BPD is the “low functioning” or “classic” borderline. 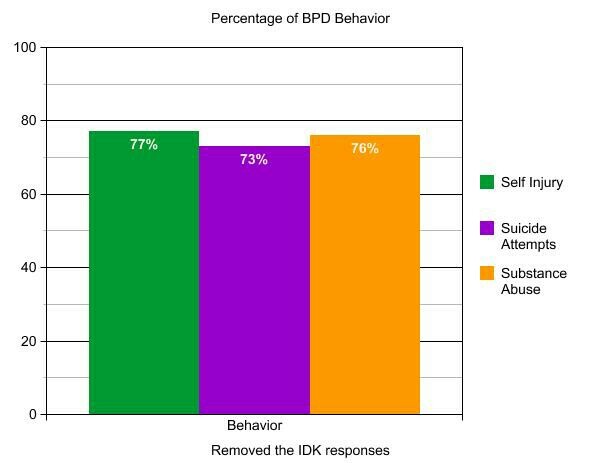 While I am sure there are others out there that operate in pretend mode (and pretend everything is ok while they “white-knuckle” their way through life), the vast majority of people with BPD seem to be caught in a spiral of ineffective and often dangerous behavior. They seem to me to be sending the message that they are in a great deal of emotional pain and are suffering greatly – that they will do anything to stop the pain that they feel. It also indicates to me that it is vital for parents of child with borderline-like traits and feelings do their best to get the child into appropriate treatment before their teenage years. How should non-classic BP’s be treated? i.e someone who is afraid to trust, persistent abandonment fears, frequently uses projection and plays the victim, but doesn’t self-harm. DBT, CBT + Mindfulness + Acceptance or Mentalization based therapy. Thanks for the quick response. Sorry for not being clear; what I meant was how should family deal with a non-classic BP? Your comment regarding therapy (DBT, CBT, etc) seems the same as for classic BP’s. If the way therapists and family deal with them is the same, then I think it is a moot point to debate whether non-classic or high-function BP’s really have BPD. The treatment is generally the same. In my book “When Hope is Not Enough” I talk about how a family member can “deal with” BPD – “classic” or not. The underlying feelings are the same in either configuration of the disorder. I mentioned CBT + Mindfulness + Acceptance because it’s like “DBT-lite” with less emphasis on self-injury and those other things. As a family member, you need to learn to identify and validate emotions and help facilitate self-soothing and self-regulation in the BPD. If you look up the I-AM-MAD communication skill on this site, it’s a good place to start, but my book would be better. Although I think CBT is good, my experience is that it is too cognitive for BPs. Psychologist recommended CBT for BP(in the context of couples therapy), so BP tried it for a while. I think the focus on automatic negative thoughts perhaps made the BP feel their emotions were wrong. I think I will check out your book. You seem to take a scientific approach; something I have a lot of respect for. CBT without the other components (Mindfulness and Acceptance – or full DBT) is too much about change and not enough about acceptance and gradual change. 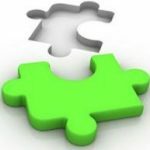 The problem with BPD is that there are typically so many problems, not all of them can be approached through change strategies at the beginning. Also, since there is so much shame involved, some level of self-acceptance is required to mitigate the shame. Otherwise the borderline will drop therapy when it gets too close to the shame. I just bought the kindle edition of the book & am reading it with Kindle for PC. 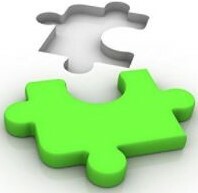 I would like to see it unlocked so short pieces of text can be cut/pasted for comments/reviews. For instance I’ve found a couple grammatical mistakes, but can’t quote them without manually typing in the text. I don’t think Ekman said we can feel two emotions at the same time; from what I recall of reading Emotions Revealed, we can feel emotions in quick succession. For example I can feel sad when my wife says something hurtful, quickly followed by anger. I already read most of the information in chapters 1-4 from other books or from forums/blogs about BPD. I just started chapter 5, and am starting to read some content that I consider worth paying money for. I’m in the part of the book on validation, step 4. So far I don’t like the book, and I’m feeling a bit angry that I paid money for it. I was offended by that statement. That means we are generally not responsible for our own lives. A BIG false assumption I see in the statement is that our choices don’t control our experiences. Even if someone else had the same biological makeup and the same starting environment it is impossible to have identical experiences since it is impossible to make the same choices. It seems a BIG contradiction to say you need to make effective choices, while at the same time saying if you were in the BP shoes you could not make effective choices. If you don’t like the book return it. Yet, I seem to see in your comments on this blog that you are clinging to something that I address early in WHINE. Perhaps you need to re-read the first few chapters and re-digest them. You haven’t accepted the basic premise of the book – you want to be right, you judge your wife as disordered and you feel you are the “OK, right, normal” one in the relationship. This gives you the moral high ground from which you can mete out punishment of your wife. Your conclusions about my words are not what is actually being said. Re-read the book with an open mind this time. You are approaching it from a concrete inflexible stance in which you’ve already predetermined what is right and what you wish to do. I think asking yourself “do I need to be right, or do I want to be effective?” would be productive. And honestly answer that question. My book explains the situation, not accuses any behavior. I returned the book; first book I’ve ever returned. You talk about being effective, but offending your readers is not a good way to sell your book. I’m sorry you were offended by my writing. That was not my intention. I guess you were not ready for my message and not accepting of what you read. When something doesn’t match what you expect I guess it gets rejected. As crazy or out-of-whack as you might see the BP’s feelings to be, she is feeling them just the same. If you were in her shoes and if you had the biological make-up and experiences that she has had, I expect you would feel and behave in the same way. One of the things that a BP needs to feel is that she is not crazy or broken. Since shame is such a vital part of BPD, feeling “different,” “crazy,” “messed up” or “broken” is akin to having to wear a scarlet letter across her chest. She believes that everyone can see through her to her shame and, when she is overcome by strong emotions and acts out on the emotions, she is likely to feel embarrassed by her behavior later. This dynamic fuels more shame. This problem is assuaged by “normalizing” the feelings. I suppose you don’t wish to see the feelings and behaviors as natural and normal given the circumstances. No empathy for the situation.